• Exhilarating ride with unrivalled control. • All important wide beam to handle huge power source and guarantee comfort. • Chined hull for outstanding stability. 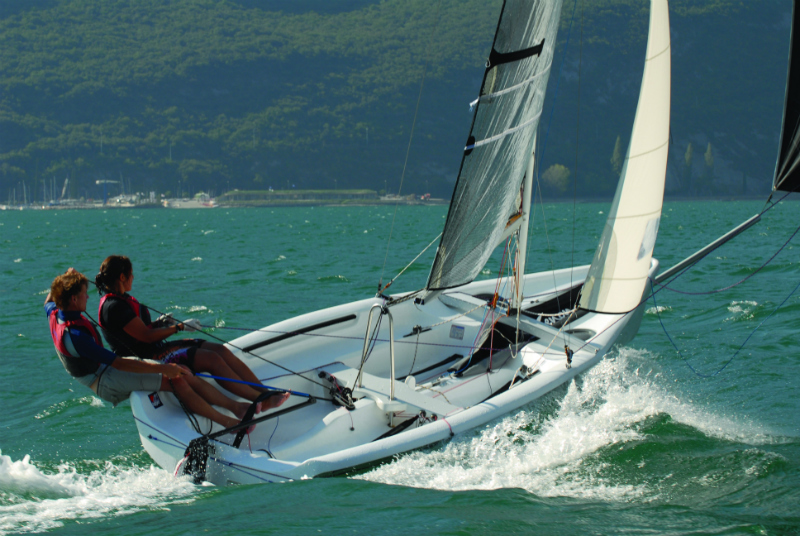 • ISAF ”Learn To sail” Class. The Xenon is an excellent high performance 2-man hiking boat perfect for getting your friend or partner into non-trapeze sailing or for club racing. The Xenon offers unbeatable value for money in comparison to many club racing options and has been selected for the prestigious Champion of Champions event, The Endeavour Trophy in 2005, 2006, 2007, 2008, 2009 and 2010. It also comes highly recommended in tests by Yachts & Yachting and DINGHY Magazine. The Xenon is an excellent high performance two person boat designed for hiking – but with the added bonus of a trapeze option. The incredibly beamy hull measures in at 2m wide. This impressive beam allows the crew to easily control the huge power source and makes for a very comfortable, spacious and uncluttered cockpit. The XENON is equipped with an elegant chine to further enhance her outstanding stability. The boat also has a gnav system which increases deck space and reduces cockpit clutter even further. The powerful battened Mylar mainsail comes with a reefing system allowing performance to be tuned to suit a wider variety of skill levels. Topper’s unrivalled TRILAM construction is used again here, meaning the boat will stand up to all the stresses of training and racing and is virtually maintenance free. It comes with epoxy centreboard and rudders and the highest specification equipment is fitted as standard. HULL COLOUR Topaz TRILAM white hull with light grey fleck effect. Great value hiking boat is set to become a modern classic club racer. Greater levels of control and stability mean the XENON appeals as a multi purpose family fun boat. CHINE TECHNOLOGY means the XENON stays afloat when competitors capsize. Fantastic control systems keep things simple and are easy to use.